Tim Burton’s ‘Nightmare Before Christmas’ 3D Bluray Announced and Detailed!!! Disney will be releasing the award winning pop icon of a film ‘Nightmare Before Christmas’ by Tim Burton on August 30th of this year in 3D. From the looks of the press release, the release will be packed with extras and will be a combo release meaning, 3D Bluray/2D Bluray/DVD/Digital Copy. Below is the press release for your excitement and enjoyment. BURBANK, California, June 3, 2011 – More astonishing and spectacular than ever before, Academy Award® nominated writer/producer Tim Burton’s overwhelmingly favorite The Nightmare Before Christmas becomes available for the first time ever to own on Disney Blu-ray 3D™ and/or 3D Movie Download, on August 30, 2011. Leaping off the screen and into living rooms this holiday season, the all-new 3D presentation of The Nightmare Before Christmas will be available as a 3-Disc Combo Pack (Blu-ray 3D, Blu-ray™, DVD/Digital Copy hybrid) and/or a 3D Movie Download,* providing fans and families alike with several great ways to enjoy the film. The Nightmare Before Christmas is produced by Academy Award® nominated writer and producer Tim Burton (Charlie and the Chocolate Factory, Corpse Bride) and Denise DiNovi (Edward Scissorhands, James and the Giant Peach), directed by Henry Selick (Coraline, James and the GiantPeach) and written by Michael McDowell (Beetle Juice, Thinner) and Caroline Thompson (Corpse Bride, The Addams Family). And the spectacular characters are voiced by the talents of Chris Sarandon (The Princess Bride, Fright Night) as Jack Skellington’s speaking voice, Danny Elfman (Corpse Bride, Charlie and the Chocolate Factory) as Jack Skellington’s singing voice and Catherine O-Hara (Home Alone, Best In Show) as Sally, to name a few. 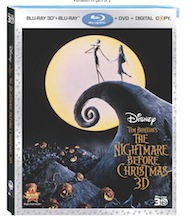 The Nightmare Before Christmas 3-Disc Combo Pack (Blu-ray 3D, Blu-ray, DVD/Digital Copy hybrid) will retail for the suggested price of $49.99 U.S./$56.99 Canada and the 3D Movie Download will retail for the suggested price of $25.00 U.S.
· What’s This? Jack’s Haunted Mansion Holiday Tour – Viewers choose the way they want to tour Disneyland’s Holiday Haunted Mansion. “On Track” explores a tricked-out version of the Haunted Mansion, while “Off Track” reveals what went into creating all the creepy fun. · Frankenweenie Short Film– A un-cut version of the Frankenweenie short with introduction by Tim Burton. · Tim Burton’s Original poem narrated by Christopher Lee – Tim Burton’s poem that inspired the creation of the movie. Now, the original verse comes to creepylife as performed by legendary actor Christopher Lee. · Film Commentary – commentary by producer and writer Tim Burton, director Henry Selick and composer Danny Elfman. · The Making of Tim Burton’s The Nightmare Before Christmas – Go behind the scenes of the very first full-length stop motion animated movie with the filmmakers. · The Worlds of Tim Burton’s The Nightmare Before Christmas – Witness the creation of the film’s richly imagined dreamscapes, including Halloween Town, Christmas Town and the Real World. 3D Movie Download = $25.00 U.S.
Tim Burton’s The Nightmare Before Christmas is an ingenious and inspired fable that cleverly mixes Halloween and Christmas for an eerily unexpected holiday celebration. The film brilliantly combinesstop-motion animation with three-dimensional sets and superb graphics to create a stunningly original movie experience. 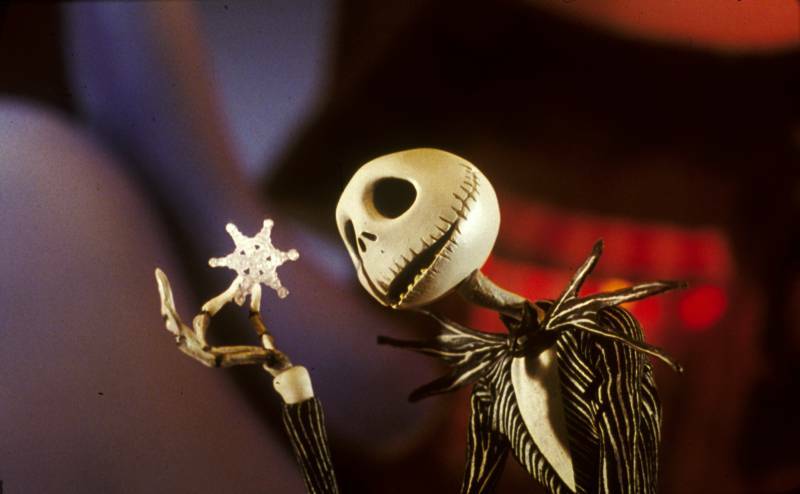 With a Grammy® nominated soundtrack by Oscar® nominee Danny Elfman (Corpse Bride, “The Simpsons”), Tim Burton’s The Nightmare Before Christmas is a modern holiday classic. Bored with his perennial role as Halloween Town’s frightening Pumpkin King, Jack Skellington wanders off and discovers the cheerful village of Christmas Town. Determined to shake things up in Halloween Town, he enlists the help of some mischievous trick-or-treaters to kidnap Santa Claus and takes over the job of delivering gifts to the children of the world himself. When his plan goes awry, Jack attempts to restore Santa to his rightful place. But first, he must rescue St. Nick from the clutches of the evil Oogie Boogie! 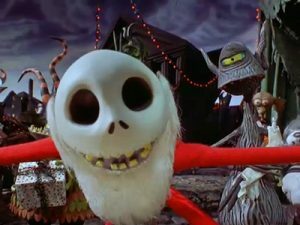 Tim Burton’s Nightmare Before Christmas will join the studios unparalleled catalog of 3D in-home movies including The Lion King: Diamond Edition (releasing October 4, 2011), Gnomeo & Juliet (released May 24, 2011), TRON: Legacy (released April 5, 2011), Tangled (released March 29, 2011), Step Up 3D (released December 21, 2010), Tim Burton’s Alice In Wonderland (released December 7, 2010), and Disney’s A Christmas Carol (released November 16, 2010). Check back for updates and for links to pre-order. This entry was posted on Friday, June 3rd, 2011 at 1:32 pm	and is filed under Film, News. You can follow any responses to this entry through the RSS 2.0 feed. You can skip to the end and leave a response. Pinging is currently not allowed.